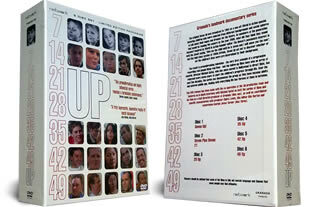 7-49 Up dvd set, the longest-running documentary project in history on 6 dvd's is a study of the influence of class on schoolchildren in England. DELIVERED FREE IN THE UK. The brain child of British director Michael Apted 7-49 visits 14 seven year old children, and then follows their lives at 7 year intervals. The children come from various background but eventually in the last instalment they all have happy contented lives. Ordering was easy and the DVDs arrived within a few days. I recommend Classicmoviestore - am trying to avoid Amazon until they pay their fair share of taxes and treat employees a bit better.